Today marks my 100th blog post on albertwstern.com! I have posted every weekday for the last 100 days. I did not start out with that goal, it simply gradually happened. I am very pleased with the accomplishment and want to celebrate with a little. I have started and abandoned many blogs before. But when I started albertwstern.com I knew I *should* have a blog, but did not want to half-start one. I loved my new website and was very excited about my new office space. Without much of a plan, the first post I wrote was about the artwork in my office, which I love! That post provided a spark of insight. I decided I would simply write and post about things I love and find interesting. Generally, the advice around social media is to pick a topic or theme and stick to it. I suppose sticking to a topic is smart but for me that feels like "work". Writing about what interests me feels more like "play". I much rather play. From the start, I wanted to post every weekday. That is not easy. But I know that I build habits much easier through consecutive streaks. There is something my mind finds motivating in knowing, "I have posted 42 days in a row, I better not miss tomorrow!" For me, skipping one day makes it easy to skip four days and then suddenly miss an entire week. Therefore, I have been very committed to posting every weekday. The best technique I know for tricking myself into a habit is simply to tell myself, "This is a thing I do now." It is not optional. It is just a thing I do. There is some kind of mental switch that gets flipped for me. There is a difference between "I am trying to post every day" vs. "I am posting every day." 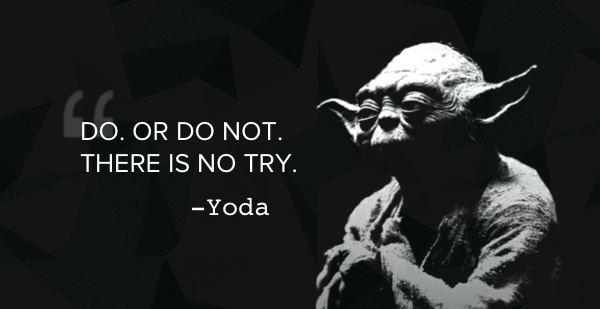 It is like that Yoda quote. The most motivating part is when posts get shared. It is a really an amazing feeling. I can see how many times each post gets viewed and when one spikes in popularity it is really exciting! By far the most popular post has been, Five Ways Star Wars Teaches Us Acupuncture Theory. More recently the post about Acupuncture in the Emergency Room has been shared quite a lot. The emergency room post caused the author of the research to reach out to me and make a connection. I love that kind of thing! It all makes writing and posting so much more enjoyable. Therefore, I want to thank everyone who has read, commented, or shared my posts. It is super kind of you. I am very thankful.